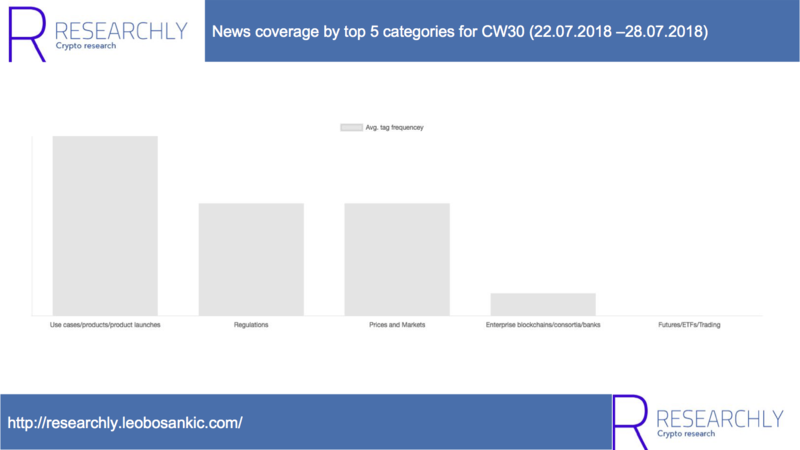 This post covers news sentiment for CW30 (22.07.2018 –28.07.2018). It is based on Researchly’s Industry Sentiment tool. The report is part of Researchly’s weekly Blockchain and Crypto report covering ICOs, Dapps, and news sentiment. You can read the previous news sentiment report here. Researchly’s Industry Sentiment tool for last week (22.07.2018 – 28.07.2018) shows, like the week before, the typical high around Prices and Markets and Regulations. Also like last week, new products and companies were launched and announced, especially in regards to enterprise blockchains. Finally, there was a lot of talk around ETFs, originating from the SEC’s decision to (again) reject the Winklevoss’ ETF. As an extra section, I am including Funding and Investments. Last Wednesday, Coinbase announced on their blog, that through a partnership with WeGift, customers can now use their Coinbase wallet to purchase gift cards. In Why Coinbase and not Bitcoin will replace Mastercard I have covered this arguing that this is not just another Coinbase service but part of a larger strategy to replace fiat money and payment processors like Mastercard. And I have also explained why Coinbase and not Bitcoin will be the one replacing Mastercard. As reported in last week’s dapp report and the dapp report of the week before Gambling and Games were the most popular Dapp categories. And the media picked up these Ponzis last week. In What Ponzis teach us about society’s responsibility and technological progression I have examined two aspects of these Ponzis. First, what do they teach us about society’s responsibility? Secondly, are they another harmful application that will eventually kill Blockchains or just a natural technological progression? It looks like they are working on a web-based solution for developing and testing Blockchains applications. Interestingly, two weeks ago Sparkster, a similar service, finished their ICO and raised $30Mio. Sparkster is a Drag and Drop Software Development platform to “Build Software with NO CODE”. Although I have argued my skepticism against Sparkster in Blockchain Report CW28: Some dapps, no ICOs, many wars, I am generally in favor of tools that enable easier development. Sparkster has raised $30,000,000. A lot of buzzwords, no working product and I am in general suspicious of Drag and Drop software tools, especially when writing blockchain-based apps with code is still in its early days. Shortly after the launch of Augur, you can now bet on the lives of selected individuals on Augur. Like in the case of Ponzis, they were bound to happen and we will have to see how they will be regulated. Also, it will be interesting to see how – and if – governments will react. In the retail investor section, Robinhood has added Litecoin and Bitcoin Cash to their app. Although this sounds as yet another product announcement I believe it to be an important part of the ongoing exchange wars, especially as Robinhood has zero trading fees. As Coindesk reports, neither ShipChain’s nor Genesis’ tokens are securities. Envion offers mobile mining solutions and raised $100 Mio. in January this year. Admittedly, it is just a patent. But it is Accenture and its a patent for Supply Chains. Two topics that keep popping up. Unsure if that’s good or bad. A lot of talks again about Bitcoin. After being bullish for the first part of the week and reaching a two-month high at $8,507 on Tuesday, it fell beyond $8,000 on Thursday most possibly because the SEC rejected Winklevoss’ bitcoin ETF. This comes at the same time as Galaxy Digital where Michael Novogratz is a chairman, reported a $134Mio. loss for Q1 2018.